Traffic backs up in the southbound lanes of Interstate 95 in Bangor in September 2018. After the inauguration of Gov. Janet Mills, Maine has been participating in but has not formally joined a regional effort that could produce a cap-and-trade system aimed at lowering vehicle emissions, the region’s largest source of carbon pollution. 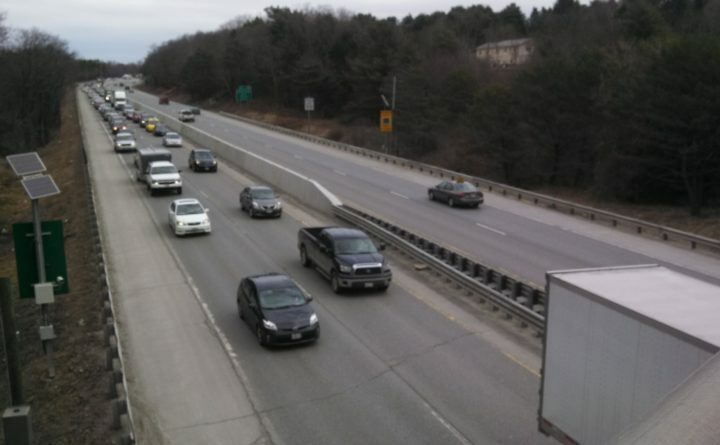 Maine originally signed onto the Transportation and Climate Initiative under Gov. John Baldacci in 2010, but the group was largely dormant until 2015 and has been ramping up activities with assistance from Georgetown University over the last two years. Nine states and Washington, D.C., are now behind the development of a regional transportation policy. When it’s done, it could mirror a regional program established a decade ago that was aimed at reducing pollution in the power sector, but Maine is a rural state that relies heavily on vehicles and could be disproportionately hit by the proposed solution than more populated states. The group could produce a policy by the end of 2019 and there’s a basic idea of what it could be, but Maine has a unique set of concerns and Mills is signaling caution. Vehicles remain Maine’s largest and most intractable source of carbon emissions from fossil fuels. Overall, emissions fell by 30 percent overall between 2004 and 2015 largely because of decarbonization in the electricity industry. Transportation emissions, however, stayed largely flat over that period. In 2015, those emissions made up roughly half of all carbon emissions in Maine. In Massachusetts, a largely urban state with well-developed public transit systems, they made up 40 percent, according to WBUR. Nationwide, they only made up 28 percent of total emissions. That general issue has pushed states in the direction of regional collaboration. This working group started just after Northeastern states — including Maine — joined the Regional Greenhouse Gas Initiative in 2009, which makes power plants hold credits for each ton of carbon pollution they produce. The overall cap on emissions is lowered over time. The states, meanwhile, can use the revenue for energy efficiency and other programs. Maine has gotten $94 million as of last year and most of that money goes to Efficiency Maine, which runs weatherization and rebate programs for energy-efficient heating systems and appliances. A Massachusetts report released earlier this year said a similar mechanism for vehicle emissions could cost the average driver $2 per month and the Acadia Center has said it could generate $1.38 billion in revenue for Maine between 2019 and 2030. Hannah Pingree, the director of Mills’ innovation office, said on Friday that officials from the state’s transportation and environmental protection departments have participated in two meetings. But she was cautious about the negotiations, saying the state is “monitoring it” and has made no decision about joining. Pingree said while “everybody” would like to reduce vehicle emissions, Mills is “concerned about mechanisms that would burden moderate and low-income Mainers.” Jordan Stutt, carbon programs director for the Acadia Center, said it was “important” that Maine participates in the process and ultimately becomes a partner in it. Mills has taken a narrower approach on vehicle emissions so far as lawmakers advance plans to change an embattled transportation funding mix. The Democratic governor has taken a narrower focus on transportation emissions so far, putting more than $5 million in Volkswagen settlement money toward boosting electric vehicle programs in the state — half toward fleet vehicles and half for a rebate program for regular drivers. However, there are only about 750 electric vehicles registered in Maine now out of 1.6 million vehicles. On a related note, the Legislature’s transportation committee on Tuesday will consider several proposals aimed at changing a state highway funding mix reliant on annual borrowing as more efficient vehicles have made the gas tax a less predictable way of funding roads and bridges. Rep. Andrew McLean, D-Gorham, the committee’s co-chair, has proposed bills that would raise the gas tax, the sales tax on vehicle rentals and fees for driver’s licenses and other registrations to fund roads. Rep. Tom Martin, R-Greene, wants to form a commission to look at the issue. Mills will sign a bill into law reinstating a policy of reimbursing solar owners for energy supplied to the grid. The governor will be at Rocky’s Stove Shoppe in Augusta at noon to sign a bill from Rep. Seth Berry, D-Bowdoinham, that would reverse a 2017 decision from the Maine Public Utilities Commission to phase out net metering, a policy established in the 1980s that allowed solar users to recoup costs of investment in a system by selling power back to the grid. That decision made few happy. Environmentalists and solar groups opposed it and former Gov. Paul LePage, a solar skeptic who didn’t believe the ruling went far enough, held a rollicking news conference urging the commissioners to resign afterward even though he appointed them. The House and Senate convene this morning before a work session-heavy day in legislative committee meetings. The Senate will hold second readings on bills to raise juror pay from $15 to $50 a day, earmark funding for free health clinics across the state and to pay for Internet access in Washington County libraries. Both chambers could also vote on a bill that seeks to remedy wage inequality. Most legislative committees could vote on bills today, on topics that include the sale and accessibility of renewable energy, including microgrids, instituting an elver fishing quota, addressing sea level rise, and providing funding for school-based health centers. Additionally, the Health Coverage, Insurance and Financial Services Committee could vote on a bill this afternoon from Rep. Jay McCreight, D-Harpswell, that would require the Maine Department of Health and Human Services to pay for abortion services for eligible MaineCare recipients at a cost of roughly $1.9 million through 2021. Listen here. Find the full legislative schedule here. — An effort to ban the use of Native American mascots at Maine schools inched forward. The Legislature’s education committee on Monday narrowly recommended passage of a bill from Rep. Ben Collings, D-Portland, that would unilaterally bar Maine public schools from adopting Native American names, symbols and images for use as mascots, team names or logos. The committee split along party lines, with all Republicans opposing the measure, largely because they believe it infringes on local control. The committee added language from Rep. Michael Brennan, D-Portland, that would extend the ban to post-secondary schools in Maine. The measure now moves to the House. The committee’s favorable reception of the bill comes less than a month after the Skowhegan school board voted to permanently remove the “Indians” mascot from Skowhegan High School, capping years of contentious debate and eliminating the last Native American school mascot in Maine. — A veteran White House security officer from Maine told Congress that the president has dangerously flouted protocol to open access to family and friends. The Washington Post reports that Tricia Newbold, a longtime White House security adviser who is from Madawaska, told the House Oversight and Reform Committee on Monday that she and her colleagues issued “dozens” of denials for security clearance applications that were later approved despite their concerns about blackmail, foreign influence, or other red flags, according to panel documents released Monday. Newbold, an 18-year veteran of the security clearance process who has served under both Republican and Democratic presidents, said she warned her superiors that clearances “were not always adjudicated in the best interest of national security” — and was retaliated against for doing so. — The trial of a Maine woman accused of killing a 4-year-old opened with photos showing that the child had suffered a plethora of injuries. On the opening day of the murder trial of Shawna Gatto, 44, of Wiscasset, prosecutors displayed photos of Kendall Chick’s body that showed multiple head and torso injuries. Prosecutors also shared input from emergency medical professionals who responded to the child’s death and recordings of Gatto telling investigators that the child was “accident-prone” and “lazy.” The trial, which will be decided by Superior Court Justice William Stokes, resumes today, with prosecutors continuing to try to make the case that Gatto beat Chick to death. Gatto’s attorney delayed his opening statement until after the prosecution presents its case. A 71-year-old woman in Scotland has been getting a lot of attention lately because she seems able to withstand extreme physical pain. After barely batting an eye at conditions and medical procedures that would have most people writhing, Jo Cameron’s pain threshold led doctors to conduct a case study that unearthed a genetic mutation, which could spur new treatments designed to reduce pain without exposure to addictive or otherwise harmful medications. I was going to use Cameron’s genetic blessing as a springboard to write something slightly humorous about my aches and pains — or about the time a former doctor told me the best way to address pain caused by herniated discs was to hang by my neck from a door frame. But then a person I love got hauled off in an ambulance at 1 a.m. today. In pain. It wasn’t funny. That’s not funny. Too many people quietly endure pain, in one manifestation or another. They resign themselves to it or surrender to treatment that exposes them to other forms of harm. In the political arena, pain is a tool used to promote political agendas. It’s the sub-text for a great deal of lobbying and rhetoric about addiction, human services, barriers to education and other topics about which people from opposite ends of the political spectrum argue. But in those contexts, it’s too often abstract — a concept that’s discussed, not felt.